For other uses, see Mike Manley (disambiguation). 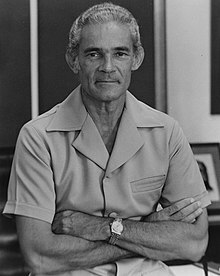 Michael Norman Manley ON OCC (10 December 1924 – 6 March 1997) was a Jamaican politician who served as the fourth Prime Minister of Jamaica from 1972 to 1980 and from 1989 to 1992. Coming from a prosperous background, Manley was a democratic socialist. According to opinion polls, he remains one of Jamaica's most popular prime ministers. Manley, the second son of politician Norman Washington Manley and Edna Manley, attended Jamaica College and then served in the Royal Canadian Air Force during World War II. In 1945, he enrolled at the London School of Economics. He graduated in 1949, and returned to Jamaica to serve as an editor and columnist for the newspaper Public Opinion. At about the same time, he became involved in the trade union movement, becoming a negotiator for the National Workers Union. In August 1953, he became a full-time official of that union. When his father was elected premier of Jamaica in 1955, Manley resisted entering politics, not wanting to be seen as capitalizing on his family name. However, in 1962, he accepted an appointment to the Senate of the Parliament of Jamaica. He won election to the Jamaican House of Representatives for the Central Kingston constituency in 1967. After his father's retirement in 1969, Manley was elected leader of the People's National Party, defeating Vivian Blake. He then served as leader of the Opposition, until his party won in the general elections of 1972. In the election of 1972, Manley defeated the unpopular incumbent Prime Minister, Hugh Shearer, as his People's National Party swept to a landslide victory with 37 of 53 seats. He instituted a series of socio-economic reforms that produced mixed results. Although he was a Jamaican from an elite family, Manley's successful trade union background helped him to maintain a close relationship with the country's poor majority, and he was a dynamic, popular leader. Unlike his father, who had a reputation for being formal and businesslike, the younger Manley moved easily among people of all strata and made Parliament accessible to the people by abolishing the requirement for men to wear jackets and ties to its sittings. In this regard he started a fashion revolution, often preferring the Kariba suit, a type of formal bush jacket suit with trousers and worn without a shirt and tie. Under Manley, Jamaica established a minimum wage for all workers, including domestic workers. In 1974, Manley proposed free education from primary school to university. The introduction of universally free secondary education was a major step in removing the institutional barriers to private sector and preferred government jobs that required secondary diplomas. The PNP government in 1974 also formed the Jamaica Movement for the Advancement of Literacy (JAMAL), which administered adult education programs with the goal of involving 100,000 adults a year. Land reform expanded under his administration. Historically, land tenure in Jamaica has been rather inequitable. Project Land Lease (introduced in 1973), attempted an integrated rural development approach, providing tens of thousands of small farmers with land, technical advice, inputs such as fertilizers, and access to credit. An estimated 14 percent of idle land was redistributed through this program, much of which had been abandoned during the post-war urban migration or purchased by large bauxite companies. The minimum voting age was lowered to 18 years, while equal pay for women was introduced. Maternity leave was also introduced, while the government outlawed the stigma of illegitimacy. The Masters and Servants Act was abolished, and a Labour Relations and Industrial Disputes Act provided workers and their trade unions with enhanced rights. The National Housing Trust was established, providing "the means for most employed people to own their own homes," and greatly stimulated housing construction, with more than 40,000 houses built between 1974 and 1980. Subsidised meals, transportation and uniforms for schoolchildren from disadvantaged backgrounds were introduced, together with free education at primary, secondary, and tertiary levels. Special employment programmes were also launched, together with programmes designed to combat illiteracy. Increases in pensions and poor relief were carried out, along with a reform of local government taxation, an increase in youth training, an expansion of day care centres. and an upgrading of hospitals. A worker's participation programme was introduced, together with a new mental health law and the family court. Free health care for all Jamaicans was introduced, while health clinics and a paramedical system in rural areas were established. Various clinics were also set up to facilitate access to medical drugs. Spending on education was significantly increased, while the number of doctors and dentists in the country rose. Project Lend Lease, an agricultural programme designed to provide rural labourers and smallholders with more land through tenancy, was introduced, together with a National Youth Service Programme for high school graduates to teach in schools, vocational training, and the literacy programme, comprehensive rent and price controls, protection for workers against unfair dismissal, subsidies (in 1973) on basic food items, and the automatic recognition of unions in the workplace. Manley was the first Jamaican prime minister to support Jamaican republicanism (the replacement of the constitutional monarchy with a republic). In 1975, his government established a commission into constitutional reform, which recommended that Jamaica become a republic. In July 1977, after a march to commemorate the Morant Bay Rebellion, Manley announced that Jamaica would become a republic by 1981. This did not occur, however. Manley developed close friendships with several foreign leaders, foremost of whom were Julius Nyerere of Tanzania, Olof Palme of Sweden, Pierre Trudeau of Canada and Fidel Castro of Cuba. With Cuba just 145 km (90 mi) north of Jamaica, he strengthened diplomatic relations between the two island nations, much to the dismay of United States policymakers. "All anti-imperialists know that the balance of forces in the world shifted irrevocably in 1917 when there was a movement and a man in the October Revolution, and Lenin was the man." Despite some international opposition, Manley deepened and strengthened Jamaica's ties with Cuba. In diplomatic affairs, Manley believed in respecting the different systems of government of other countries and not interfering in their internal affairs. Manley was Prime Minister when Jamaica experienced a significant escalation of its political culture of violence. Supporters of his opponent Edward Seaga and the Jamaica Labour Party (JLP) and Manley's People's National Party (PNP) engaged in a bloody struggle which began before the 1976 election and ended when Seaga was installed as Prime Minister in 1980. While the violent political culture was not invented by Seaga or Manley, and had its roots in conflicts between the parties from as early as the beginning of the two-party system in the 1940s, political violence reached unprecedented levels in the 1970s. Indeed, the two elections accompanied by the greatest violence were those (1976 and 1980) in which Seaga was trying to unseat Manley. In response to a wave of killings in 1974, Manley oversaw the passage of the Gun Court Act and the Suppression of Crime Act, giving the police and the army new powers to seal off and disarm high-violence neighborhoods. The Gun Court imposed a mandatory sentence of indefinite imprisonment with hard labour for all firearms offences, and ordinarily tried cases in camera, without a jury. Manley declared that "There is no place in this society for the gun, now or ever." Violence flared in January 1976 in anticipation of elections. A state of emergency was declared by Manley's party the PNP in June and 500 people, including some prominent members of the JLP, were accused of trying to overthrow the government and were detained, without charges, in the South Camp Prison at the Up-Park Camp military headquarters. Elections were held on 15 December that year, while the state of emergency was still in effect. The PNP was returned to office. The state of emergency continued into the next year. Extraordinary powers granted the police by the Suppression of Crime Act of 1974 continued to the end of the 1990s. Violence continued to blight political life in the 1970s. Gangs armed by both parties fought for control of urban constituencies. In the election year of 1980 over 800 Jamaicans were killed. Jamaicans were particularly shocked by the violence at that time. In the 1980 elections, Seaga's JLP won and he became Prime Minister. As Leader of the Opposition Manley became an outspoken critic of the new conservative administration. He strongly opposed intervention in Grenada after Prime Minister Maurice Bishop was overthrown and executed. Immediately after committing Jamaican troops to Grenada in 1983, Seaga called a snap election – two years early – on the pretext that Dr Paul Robertson, General Secretary of the PNP, had called for his resignation. Manley, who may have been taken by surprise by the maneuver, led his party in a boycott of the elections, and so the Jamaica Labour Party won all seats in parliament against only marginal opposition in six of the sixty electoral constituencies. Manley was largely opposed by the United States government for conducting close relations with Fidel Castro and Cuba during the Cold War. Manley allowed Cuban technicians to work on Jamaican soil for projects. 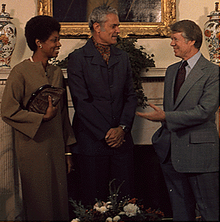 In 1977, Manley visited President Jimmy Carter at the White House to remedy the situation. Details of the meeting, however, were never disclosed. During his period of opposition in the 1980s, Manley, a compelling speaker,[opinion] travelled extensively, speaking to audiences around the world. He taught a graduate seminar and gave a series of public lectures at Columbia University in New York. In 1986, Manley travelled to Britain and visited Birmingham. He attended a number of venues including the Afro Caribbean Resource Centre in Winson Green and Digbeth Civic Hall. The mainly black audiences turned out en masse to hear Manley speak. Meanwhile, Seaga's failure to deliver on his promises to the US and foreign investors, as well as complaints of governmental incompetence in the wake Hurricane Gilbert's devastation in 1988, also contributed to his defeat by the popular Manley in the 1989 elections. By 1989, Manley had softened his socialist rhetoric, explicitly advocating a role for private enterprise. With the fall of the Soviet Union, he also ceased his support for a variety of international causes. In the election of that year he campaigned on a very moderate platform. [opinion] Seaga's administration had fallen out of favour – both with the electorate and the US – and the PNP was elected. He was sworn in as a Member of the Privy Council of the United Kingdom in 1989. Manley's second term focused on liberalizing Jamaica's economy, with the pursuit of a free-market programme that stood in marked contrast to the interventionist economic policies pursued by Manley's first government. Various measures were, however, undertaken to cushion the negative effects of liberalisation. A Social Support Programme was introduced to provide welfare assistance for poor Jamaicans. In addition, the programme focused on creating direct employment, training, and credit for much of the population. The government also announced a 50% increase in the amount of food stamps for the most vulnerable groups (including pregnant women, nursing mothers, and children). A small number of community councils were also created. In addition, a limited land reform programme was carried out that leased and sold land to small farmers, and land plots were granted to hundreds of farmers. The government had an admirable record in housing provision, while measures were also taken to protect consumers from illegal and unfair business practices. In 1992, citing health reasons, Manley stepped down as Prime Minister and PNP leader. His former Deputy Prime Minister, Percival Patterson, assumed both offices. Michael Manley was married five times. In 1946, he married Jacqueline Kamellard, but the marriage was dissolved in 1951. Manley then married Thelma Verity in 1955; in 1960, this marriage was also dissolved. In 1966, Manley married Barbara Lewars (died in 1968); in 1972, he married Beverley Anderson, but the marriage was dissolved in 1990. Beverly wrote The Manley Memoirs in June 2008. Michael Manley's final marriage was to Glynne Ewart in 1992. Manley had five children from his five marriages: Rachel Manley; Joseph Manley; Sarah Manley; Natasha Manley; and David Manley. Manley wrote seven books, including the award-winning A History of West Indies Cricket, in which he discussed the links between cricket and West Indian nationalism. The other books he wrote include The Politics of Change (1974), A Voice in the Workplace (1975), The Search for Solutions, The Poverty of Nations, Up the Down Escalator, and Jamaica: Struggle in the Periphery. On 6 March 1997, Michael Manley died of prostate cancer, the same day as another Caribbean politician, Cheddi Jagan of Guyana. He is interred at the National Heroes Park, where his father Norman Manley is also interred. ^ Robert Buddan (8 March 2009). "Michael Manley: nation-builder". Jamaica Gleaner. Archived from the original on 25 January 2012. Retrieved 11 January 2012. ^ "Where Would Jamaica Be Without Michael Manley?". Jamaica Gleaner. 12 August 2012. Retrieved 11 March 2013. ^ a b Lentz, Harris M., III (1994). Heads of States and Governments. Jefferson, NC: McFarland & Company, Inc. pp. 451–452. ISBN 0-89950-926-6. ^ "Michael Manley - prime minister of Jamaica". Encyclopedia Britannica. Retrieved 11 February 2019. ^ a b c Communications, Peter Scott Chrysalis. "Political Leader". Retrieved 11 February 2019. ^ Waters, Anita M. (1985). Race, Class, and Political Symbols: Rastafari and Reggae in Jamaican Politics. Transaction Publishers. p. 98. Retrieved 8 July 2012. ^ Communications, Peter Scott Chrysalis. "Trade Unionist". Retrieved 11 February 2019. ^ a b c d e "Jamaica Observer Limited". Jamaica Observer. Retrieved 11 February 2019. ^ a b Insight Guide: Jamaica, Insight Guides, APA Publications, 2009. ^ a b Chuck Stewart, The Greenwood Encyclopaedia of LGBT Issues Worldwide, Volume 1. ^ a b Kari Levitt, Reclaiming Development: independent thought and Caribbean community. ^ a b Michael Kaufman, Jamaica under Manley: dilemmas of socialism and democracy. ^ a b c Darrell E. Levi, Michael Manley: the making of a leader. ^ a b c Euclid A. Rose, Dependency and Socialism in the Modern Caribbean: Superpower Intervention in Guyana, Jamaica and Grenada, 1970-1985. ^ a b c d David Panton, Jamaica’s Michael Manley: The Great Transformation (1972-92). ^ Michael Burke, "Queen, emperor and republican status", The Jamaica Observer, 21 April 2016. Retrieved 2 September 2016. ^ Communications, Peter Scott Chrysalis. "World Statesman". Retrieved 11 February 2019. ^ Silverman, Jon (27 May 2010). "Jamaica violence 'linked to US drug market'". Retrieved 11 February 2019 – via www.bbc.co.uk. ^ "Stalag in Kingston". Time Magazine. 23 September 1974. Retrieved 14 January 2009. ^ The Daily Gleaner, Monday, 6 July 1986, p. 14. ^ "Jamaica Observer Limited". Jamaica Observer. Retrieved 11 February 2019. ^ "The Rt. Hon. Percival James Patterson (1935 - ) - The National Library of Jamaica". nlj.gov.jm. Retrieved 11 February 2019. ^ Payne, Anthony (8 March 1997). "Obituary: Michael Manley". The Independent. London. Retrieved 12 May 2010. ^ a b Communications, Peter Scott Chrysalis. "Political Leader". Retrieved 11 February 2019. ^ Michael Manley, A History of West Indies Cricket (London: Andre Deutsch, 1998). ^ Communications, Peter Scott Chrysalis. "Writer". Retrieved 11 February 2019. ^ "Cheddi Jagan - premier, Guyana". Encyclopedia Britannica. Retrieved 11 February 2019. Henke, Holger (2000). Between Self-Determination and Dependency: Jamaica's foreign relations, 1972-1989. Kingston: University of the West Indies Press, 2000. Levi, Darrell E. (1990). Michael Manley: the making of a leader. Athens, GA: University of Georgia Press, 1990.